The video below helps explain why I always use a pattern when I’m creating a paper mache animal sculpture. I didn’t come up with this idea myself, but once I found the idea I realized how important it was. In fact, this is idea made it possible for me to write my own book, Make Animal Sculptures with Paper Clay. Watch the video to see how the patterns work, and why they help you create sculptures that turn out exactly the way you want them to. As I mention in the video, the idea originally came from the book 3-D Wizardry: Design in Papier Mache, Plaster and Foam, by George Wolfe. It’s been out of print for years, but you can still get a used copy on amazon.com if you follow that link. At the moment they have one for just 5 bucks, and it’s an interesting read. 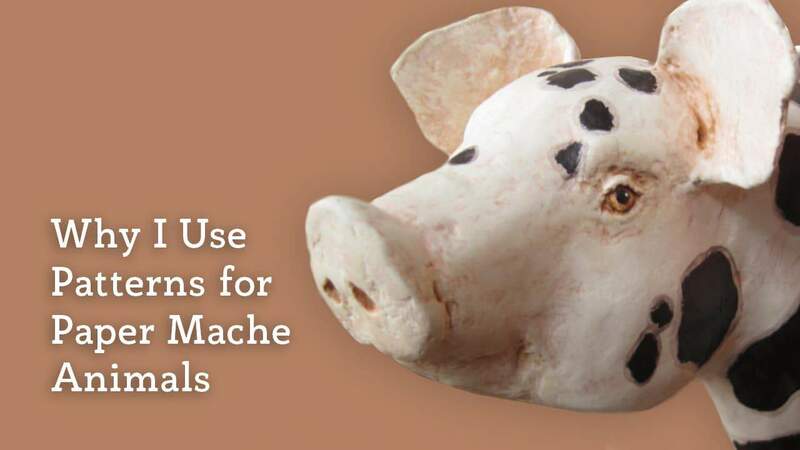 So, why do patterns make it easier to create paper mache animal sculptures? They set the proportions and outlines before you start, when it’s still really easy to make changes. And they tap into our instinctive ability to recognize animals instantly from their outlines. If you get that outline right, you can fudge a bit when you fill in the forms, but people will still see a realistic sculpture. You can make a sketch of an animal, like Chris did when she made her life-sized giraffe, and use it for your pattern. That’s also how Rex did it when he made his “piggy” banks. Then you can use that sketch to create a completely original sculpture of any animal you want. Or you can use one of the patterns in the Art Library or one of my Premium Patterns, and add your own distinctive creative touches. Either way, you’ll be creating a one-of-a-kind sculpture, and you’ll know how the shapes are going to turn out before you even start. If you’ve created an animal sculpture from one of the patterns on this site or from your own pattern, we’d love to see how it turned out. I have just finished my first tiny dog..a Great Dane..it took ages to make the structure and I was surprised to find I only needed 1 layer of paper mache. It seemed to be very hairy and I used several layers of acrylic gesso before painting it. H Drusilla. We’d love to see your Great Dane. Did you try to upload a photo? If you did, it didn’t work – probably because it was too big. I hope you’ll try to reduce the file size and try again – we’d love to see it. Excellent thanks..I’ll post a pic as and when I manage to do one! Also thanks for your video on creating your Papier Mache sculpture of your cat..very helpful ? Excellent thanks Jonni..that really makes sense ( humanity recognising patterns of animals). But I have cats and would like to apply your process to making some of those too..does that sound ok? I’ll check for a pattern on your menu first!